Product prices and availability are accurate as of 2019-04-19 22:37:25 UTC and are subject to change. Any price and availability information displayed on http://www.amazon.com/ at the time of purchase will apply to the purchase of this product. We are proud to present the famous Seismic Audio - PAIO12 - Active 12 Inch PA Speaker System - Bluetooth, Wireless Mic, Speaker Stands and Cables. With so many available today, it is good to have a make you can trust. The Seismic Audio - PAIO12 - Active 12 Inch PA Speaker System - Bluetooth, Wireless Mic, Speaker Stands and Cables is certainly that and will be a perfect purchase. 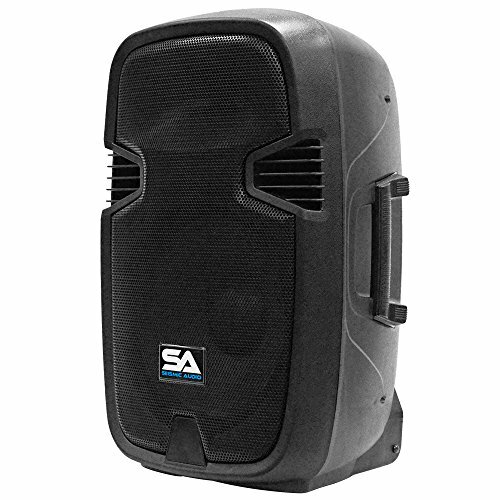 For this great price, the Seismic Audio - PAIO12 - Active 12 Inch PA Speaker System - Bluetooth, Wireless Mic, Speaker Stands and Cables comes widely recommended and is always a popular choice amongst many people. Seismic Audio have included some great touches and this means great value for money. Portable Powered 12 Inch PA or Karaoke PA Speaker System Model: Model: PAIO12 | Pair of 12" Speakers (1 Active, 1 Passive), Pair of Speaker Stands, Wireless Microphone, 20' Speakon Speaker Cable, Power Cord, Bluetooth Remote Control. Power Ratings: 400 Watts RMS; 800 Watts Program; 1600 Watts Peak. Class A/B High Powered Amplifier | 12 Inch Woofer with a 30 oz Magnet and 2 Inch Voice Coil per Cabinet | 1" Tweeter per Cabinet. Nominal Impedance: 4 Ohms | Frequency Response: 50Hz - 18kHz | Sensitivity: 97 dB. Built In 2 Band EQ l Built In Bluetooth | Built-In USB (2.0)/SD/MMC/MP3 | FM Built in | Connector(s): XLR, 3.5mm, RCA. 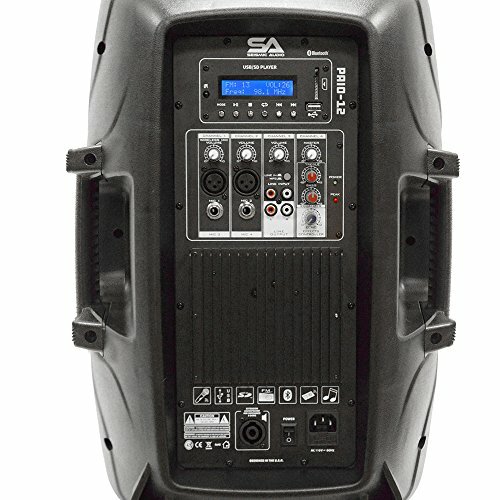 Wireless VHF Microphone Included | 260.3 mHz Range. Wireless Remote Included to control MP3 functions. Injection Molded Polypropylene Enclosure with side handle. 20 Foot Speakon speaker cable to connect speakers | Power Cord included. Pair of heavy duty Speaker Stands also Included in this package. Dimensions: 14" x 12" x 22.5" per Cabinet. Weight: Active Speaker: 21.1 lbs | Passive Speaker: 17.3 lbs. 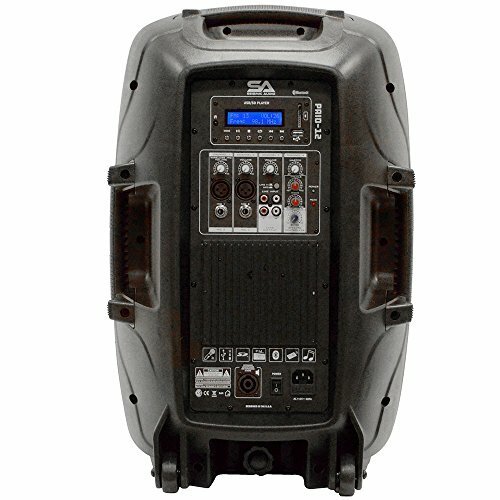 Warranty: One Year WarrantyThe PAIO12 is the complete portable, party, or karaoke PA System. 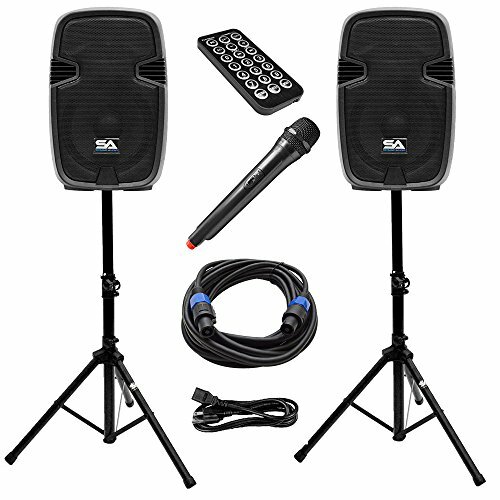 This package has everything you need for a professional PA setup to get the party started and keep it going. 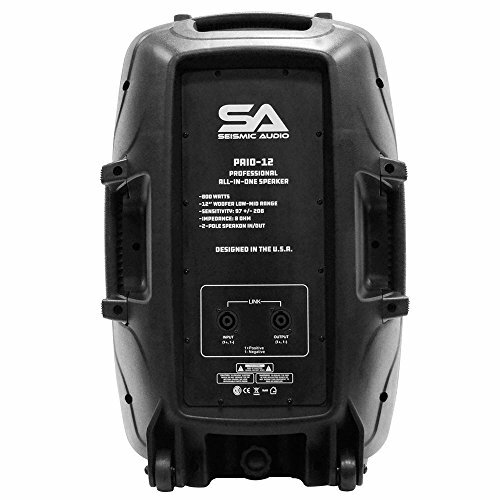 In this package you get two 12" PA/DJ speakers, one active and one passive. 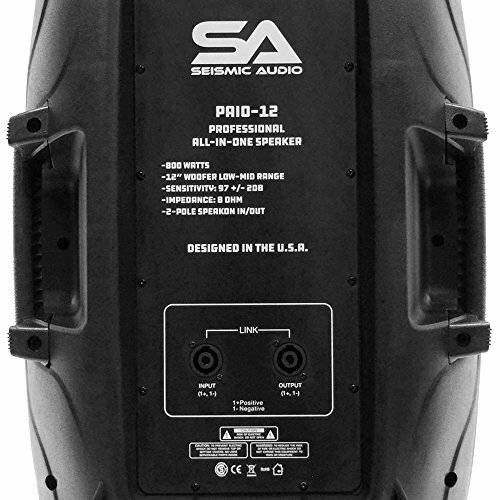 The active speaker has a built in amplifier to power the passive. A 20' Speakon cable is included to connect the two speakers. Combined, these speakers put out an amazing 1600 watts of power. Also included in this package is a pair of Speaker Stands, a Wireless Microphone, Remote Control and Power Cable. This package is truly all-in-one and has everything you need.